There are two types of people in the world: those who absolutely love Halloween and those who are completely indifferent. I’m team captain of the former; Halloween is one of my favourite holidays of the year. As much as I love Christmas it always comes with so much pressure, from agonising over what presents to buy to being totally partied out by the time the big day actually arrives. Halloween is full of festive merriment but without the expectations. It’s all just fun parties, cute outfits and scary movies. What’s not to love? This year, as Halloween falls on a Monday, I’m planning a bumper celebration of scary film screenings and fun nights out to get dressed up. Much like Christmas, Halloween can be exactly what you want it to be. I love the opportunity to get dressed up so I like having one night out but I’m also a huge horror movie fanatic so I love all the spooky film screenings too. There are also tons of attractions and events going on too, from London Dungeons to the Ghost Tours. Being such a huge Halloween fan, I was absolutely thrilled when Attraction Tix recently got in touch to ask if I wanted to preview the new Halloween experience at the London Tombs. Despite going to London Dungeons about half a dozen times (and being pretty underwhelmed by the scare factor), I have never been to London Tombs so this was the perfect opportunity to check it out. London Tombs is located at London Bridge too, practically across the road from London Dungeons but unlike the tame dungeons it has a reputation for being super scary – it’s been voted the UK’s scariest attraction for the 8th year running! Each year, London Tombs holds their annual adults-only Phobophobia event. 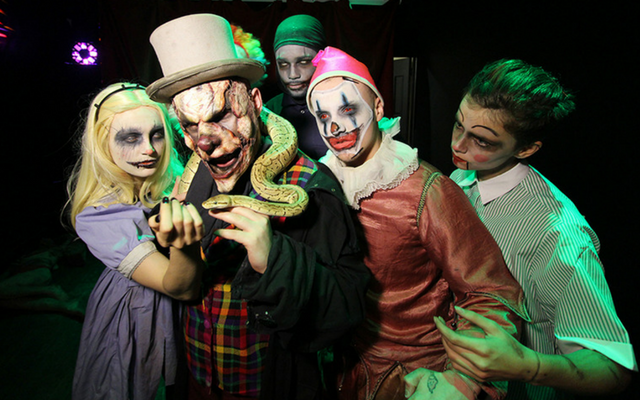 The 10-day fear-provoking extravaganza sees the Tombs transformed into a brand new themed house of horrors. This year, the theme is The Nightmare of the Ventriloquist, think crazed ventriloquist maniac and tons of very freaky puppets and dolls. It sounded horrific, in the best way possible! On Tuesday, I popped down to the Tombs for what promised to be a terrifying night of frights. The night started with the obligatory drinks and nibbles…and some snakes! Real live snakes. The closest I’ve come to a snake is wearing them on my feet and while I’m not scared of snakes, I was a little hesitant to get up close with one. After some prompting by Sherin, my date for the night, I picked up a baby snake and…it wasn’t that bad! After another glass of wine, I plucked up the courage to handle the largest snake. I feel like I’m a pro now! The actual experience was petrifying. We started off with an introduction with the ventriloquist, complete with blood-splattered apron and studio with body parts strewn everywhere. We then had to make our way through a scary maze-like route starting with disorientating strobe-lit rooms and mannequins who may or may not be alive. As you progress deeper into the depths of the ventriloquist’s lair, the shadows get darker and the discarded marionettes get more and more twisted. For the last stretch, our group was advised to hold onto the shoulders of the person in front as we weaved our way through the house of horrors. I screamed so much I practically lost my voice. As a huge Halloween lover, I had an absolute ball! It was genuinely terrifying and I was secretly glad to have someone to hold onto for the latter stretch! I thoroughly recommend it to everyone except the most sensitive of souls; you’re guaranteed to have a horrific time in the best way possible! Just make sure you take someone you’re comfortable cosying up with! Thanks to the team at Attraction Tix for an incredible evening. To book tickets, please visit the Attraction Tix website and save up to 73% compared to booking directly.